There are many positive things that have come from creating Desserts Required. One of them is that my mother has started baking more. A bit of history is probably in order. You see my mother is a fabulous cook and baker. Unfortunately, for my siblings and me, we did not really experience her culinary skills very often as Mom cooked primarily for company and children were not always welcome at those dinners. To be fair I do not think anyone makes a better rib roast than my mom; and my dad (as previously mentioned) prefers Mom’s Lemon Meringue Pie to mine. Yet Mom was not known for expanding her repertoire back in her cooking/baking days. Ever since Desserts Required came into her life, Mom is whisking and layering and going out of her normal comfort zone, all in the interest of supporting me. I must say, it is really wonderful to know that she is doing so much baking and sharing her new found passion with others. Okay, truth be told, Mom actually gives the food away because she does not know the meaning of portion control, when it comes to her own eating habits. Yet, one of Mom’s new challenges has been drizzling chocolate onto the top of various desserts. As you know, I love drizzling. I like the look that drizzling leaves on cakes, cookies and brownies…and therefore drizzle fairly often. 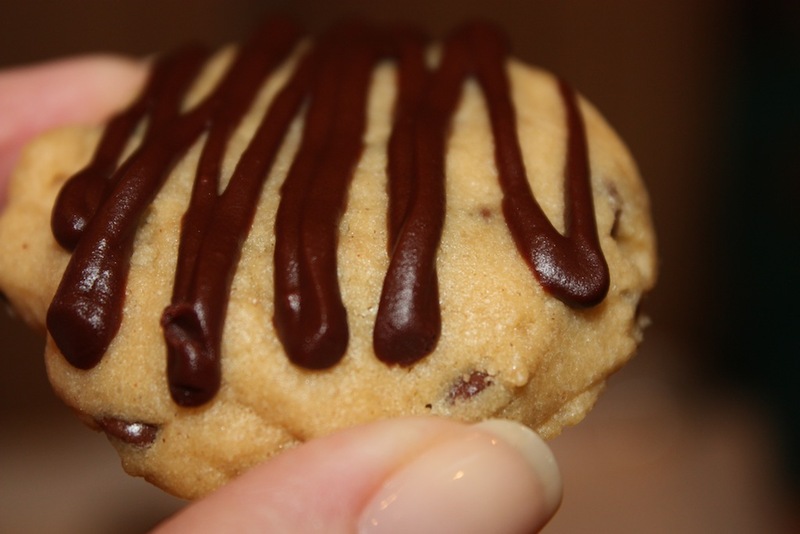 All of that communication made me think of my Chocolate Chip Peanut Butter Stripe Cookies. The peanut butter cookies have just the right amount of chocolate in them to please those of us who love that combination. Yet, it is the drizzle of chocolate on top that makes me really happy. Preheat the oven to 325°. Line 2 cookie sheets with parchment paper and set aside. Whisk the flour, baking powder, baking soda and salt. Set aside. Cream the butter, sugar and light brown sugar until well mixed. Add the peanut butter and beat until smooth, scraping the bowl down as needed. Mix in the eggs. Add the vanilla. Add the dry ingredients and mix briefly on low speed. This should not be totally blended. Lastly, add the mini-chocolate chips and mix only until the chips are mixed in. Measure the cookies with a ½ tablespoon measuring scoop. Flatten the ball slightly with your fingers and push any straggling dough into the cookie. These cookies do not spread. Bake for 13 minutes, rotating the pans top to bottom and front to back halfway through. Let cool on the baking sheets. Combine the chocolate, butter and whipping cream in a bowl. Microwave to melt and stir until smooth. Let the chocolate mixture stand for 5 minutes. Place the chocolate topping in a quart size freezer baggie. Cut a small piece off a bottom corner. Drizzle the topping over the cookies. A ½ tablespoon measuring spoon may be used instead of a measuring scoop. Round the dough into balls and then flatten slightly and continue with recipe. If you are short of time, eliminate the topping. They are still addictive. They look yummy, but will need to taste to be sure! I think you are right Faith. We will have to figure out a solution! YUM… I am going to ask my other baker friend & neighbor, who cooks gluten free, to figure out how to bake these gluten free! Otherwise, my family will enjoy and tell me how they taste. When you do, let me know. I would love to share the info with others. Thanks KJS. These look so awesome! I will try these with the girls next weekend. Your pics look outstanding too. Thanks so much Jackie. Have a great time at your girls weekend. I am sure these cookies will sweeten the time together.